Short story anthologies are difficult to review because the stories tend to be chosen for their diversity. This collection features fourteen stories about people meeting and predominantly (but not exclusively) falling in love. They range from the mundane (boy and girl hold up in a bathroom at a party that is about to be raided by the police) to the fantastic (boy and girl become “ensnared” and watch their alternative futures unlock) to the truly exotic (a “department of dead love” where you can perform an autopsy on your failed romance). They tend to lean towards LGBT themes and there are a few attempts to bring in some non-white perspectives (most notably through Ibi Zaboi’s story of an African dressmaker). Strikingly, the editor is anonymous, there is no introduction, and the authors have no bios included. For the most part, these are pretty good stories. A few of them could have been expanded upon and been quite enjoyable in a fuller length, but most of them are nicely self-contained. There are no outright duds, but little that stands out either. 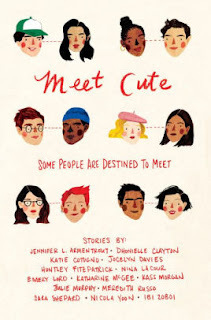 Two strangers getting to know each other is a pretty basic rubric and the anthology has the feeling of being a creative writing exercise for a group of established authors.